Articulated presents here a careful collection of 100 Electric Fans, HVAC, AHU, and Mechanical Drones. After months of capture, we recorded, selected, and edited this unique library featuring rich, varied, and useful assets ready-to-use for any game or movie project. These sounds can serve to inspire life inside environments, provide industrial tones, domestic houses, or back alleys, setting moods or atmospheres. They can also serve as elements to design mechanical machine or engine sounds. The sonic quality extends a large spectrum from clean, modern, to old and rusty, on rooftop, indoor, flush ceiling-mounted, Bathroom extractor, or floor stand; along with many flavours like metal, plastic, smooth or raspy rattles with gurgling wobbles. Some of the Sounds have useful varied point of perspectives (Close-up, distance), and most of them are ‘loopable’. 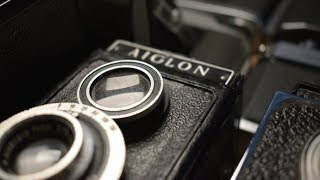 Discover the obscure sounds of 24 film cameras designed between the 1930s and 1970s. Carefully organised into 159 files, the 20th Century Cameras library offers over 3900+ sounds recorded at pristine 24bit/96kHz, thus allowing you to not only use the mechanical sounds of the cameras for their intended purpose, but also for sound design. In order to help you navigate through the plethora of sounds available, rich SoundMiner metadata has been carefully crafted in order to describe the sounds as simply as possible, using multiple keywords and terms, where needed. The library contains mostly mechanical sounds, such as the sound of shutter release at different shutter speeds, knobs, latches, wheels, and more, in addition to some Foley sounds as well. Due to the age of the cameras, most of the shutter release sounds have slight variations between them, even at the same shutter speed. An update for the library is on its way, which will include the sound of a few different types of camera film being unwrapped, handled and installed into cameras. The update will be free for the people that have already purchased the library. The library also comes with a free eBook which can be viewed and downloaded here. In addition to the SoundMiner metadata sheet down below, the eBook provides information as to how older cameras work, and more details as to how each of the cameras recorded for the library work. The book goes into a fair bit of detail as to what sounds each camera offers, without getting too technical. Do you want to make a robot or some other mechanical object sound unique? Or do you need high class heavy mechanical motor or servo sounds for layering purposes? The 3D Printer library is a collection of high quality motor, servo and mechanical movement sounds that can help you make a nice looking robot sound like a mean killing machine. The library is also a great and affordable way to add uniqueness to your sound effects. The library was recorded with two sets of microphones: A stereo pair of JrF C-series contact microphones were used to capture the more delicate inner sounds of the printer while a stereo pair of Sennheiser MKH8040 microphones recorded the more raw outer sound of the mechanical motor movements. Get the sounds of a Printrbot 3D printer – with four NEMA 14 stepper motors -, in this interesting SFX library by New Sound Lab. The high torque motors connected to a pulley system control the X-Y-Z movements of the aluminum extruder and metal print bed. When printing three-dimensional objects, these fast and precise movements result in a unique barrage of percussive and rhythmic mechanical noise. These sounds were captured using three different recording setups: Barcus Berry contact mics, RF coils, and combined contact mic / RF coil into a Sound Devices 702 recorder. The resulting sounds are a mix of grainy, gritty atonal patterns, robotic percussive bleeps, glitchy digital beeps/clicks, low fidelity drones, and chaotic noise. Both raw recordings, and processed elements are included and ready for further sound manipulation. 3Dimensional Printing is the multicolored result of different recording sessions of a couple of 3D printers (the Sharebot NG – Next Generation and the DeltaWASP 20 40) at Fabb and at FabLab Milan between 2014 and 2015. All the sounds were recorded directly as uncompressed .wav files through both a RME Fireface UCX and a Zoom H6 Portable Recorder. Duration ranges vary from 1 to 5 minutes, with the most sonically interesting excerpts from full printing cycles. Lots of pattern and sequences are available for selection and transformation. – Zoom MSH-6 MS Capsule (the stereo image of the Mid-Side recordings is rendered as balanced stereo LR files). Comprised of three action packed libraries, this bundle includes HERO, BROKEN, and MELEE. Save by bundling all three in a single library. HERO contains over 7 GB spread across 2572 construction kit sounds and 274 designed sounds and includes sword fights, stabbing, guillotines, impaling, battle cries, shields, drawbridges, armor, Foley and more. BROKEN boasts over 9 GB spread across 1940 construction kit sounds and 326 designed sounds. From car crashes, explosions, crumbling buildings, earthquakes, ripping earth and metal, to debris, and more. MELEE contains 4 GB spread across 1596 construction kit sounds and 288 designed sounds. From punches, kicks, blocks, bodyfalls, grabs, slaps, bone breaks, blood splatters, and more. This collection of Air Conditioners, Vents, and Ducts gives a collection of understated airs and room tones appropriate for most every day situations. A unique collection of antique bells of various shapes and sizes. The library features the House Bell, Hame Bell, Cup Bell and the Crotal Bell. Information on the Cessna 172 from Wikipedia:The Cessna 172 Skyhawk is an American four-seat, single-engine, high wing, fixed-wing aircraft made by the Cessna Aircraft Company. First flown in 1955, more 172s have been built than any other aircraft. Amusement Rides & Ambiences is a unique collection of hard to access amusement park sound effects. Package includes high-quality multichannel recordings captured with a full access to the amusement rides – and a total of 8 rides are included! Some recordings were made in an amusement park that was closed from the public. This enabled us to capture the sound effects as clean as possible without background music or people. Convoy, Disk’O Coaster, Log Flume, Magic Bikes, Piggy Train, Pirate Ship, Supernova, Take Off. Ambience recordings are authentic amusement park ambiences with people and amusement rides. They include children and adults, cheering and screaming, chatter in different languages, amusement rides loading and operating, and more. All sounds were recorded in Särkänniemi amusement park, Tampere, Finland. Also available in the special Complete Amusement Park Sound Bundle. Analog Days contains 390 sounds extracted from old portable cassette players, Retro WW tube radios, vintage turntable vinyl record players and retro tape machines. This is really a sound time capsule ready to send your projects back to the good old analog days and give that sense of analog imperfection that makes the sound really interesting. This library features recordings of a Moog analog synthesizer. The sounds range from raw lo-fi zaps, buzzes and glitches, to more futuristic high-tech robot movements, morphs, vocalizations and drones. Both source recordings, and designed sound effects are included for further sound manipulation. This collection started as a mic test and turned into a library. What is unique about the collection is that the phone was taken apart so you get each individual element as clean as possible. It was recorded with shotgun mics, a TLM 103 to see how it sounded with something other than dialogue, and a Cold Gold contact mic at 96 khz, which was the biggest surprise as it sounds like a high definition retro mic when placed on the back of the phone's rotary dial. Skip the antique hunt and listen to these vintage sounds. The doors are very kind, but don’t make them angry. They could lose their temper resulting in a very noisy bang. This library enriches the sfx world with new door and gate objects, both source and designed, with variety of expressive actions and perspectives. The everyday usual noises along with fantasy stimulating sounds – e.g. deep “dungeon” metal door, high pitch squeaking wire-netting gate, heavy church gate and so on. To make the slams and smashes even more hard, heavy and dirty, wildly designed “Angry” versions have been added. A killer antique accordion full of paper crinkles, key clacks, sick sounding wheezes and old wood creaks. The antique accordion was rescued from a local antique shop. It has a hole in the bellows that creates a distinct wheezing sound, and it is loaded up with strange squeaks, pops and paper textures. We rolled on this instrument for about an hour, and did everything from flicking the keys to dropping and pounding it. The accordion took some abuse, but in the end what it gave back was a wealth of old sounding textures you can’t fake. Note: Can be used without Kontakt too! All Kontakt instrument libraries include fully unlocked and accessible metadata tagged .wav files. You don't need any version of Kontakt to use these files as a standalone sample library. Get the sounds of 13 different coffee and herbal grinders. These small wooden and metal devices give grainy textures to any material + they sound really funny at times, and can be used as sweetener for funny toy sounds. Due to the recordings with a piezzo disc, they have a lot of deep and rumbling content. The other mics were the Neumann TLM 102, The DPA 4060 and the amazing Sennheiser MKH 8040. They all cover different and unique perspectives. All Sounds are always packed with rich iXML Metadata. Get the sounds of an ancient water spelt mill from 1529, as well as an antique tannery, also driven by a huge water wheel from 1699. Both mills have been working for hundreds of years and continue to work even today. This library is recorded in high resolution audio in 24Bit/96kHz on a Sound Devices 702T with Sennheiser 8040 Mics in Mono or ORTF Stereo. While straying through several antiques shops and flea markets I unveiled a lot of very interesting and organic sounds with character. Sounds that only prop up with plenty years of service can do. So this library is a versatile and composite collection of all those squeaky, creaky, rusty sounds with a lot of personality. Here you will find all the little vintage sonic gems. From mechanical cameras and rusty coffee mills, over-jammed drawers, doors and locks, to sewing machines, typewriters and malfunctioning projectors. You get over 1000+ready to use sounds. All painstakingly edited, cleaned and decently named for you. All source sounds were recorded with Sonosax SX-R4+ with a Sennheiser MKH8050+MKH30 M/S rig, a Sound Devices MixPre-6 + MKH8060 and a Sony PCM-D100. All sounds come with embedded Metadata. Want the sounds of a garage / auto repair workshop? The Auto Workshop SFX library features lots of different tool sounds and general ambiences from automotive workshops (originally recorded for scenes in the Bulgarian feature Godless). The idea was to capture the sounds at both closeup and off-mic, to be able to fade easily between them. A mono microphone was placed close to the source, and a set of stereo microphones was set up further away, capturing more of the room and echo. The result is very usable, and the ability to fade between closeup and wide shot works very well. After umbrella sound effects, but with no time to record them yourself? The Automatic Umbrella sound effects library gets you 159 umbrella sounds, including opening, closing, folding, tapping, squeezing, cleaning, catching, locking and unlocking clasp and much more. The library was recorded using a highly acclaimed Nevaton MC48 microphone and a Tascam DR-70d recorder, and comes with metadata. Need bicycle sound effects? This SFX library delivers more than 650 bike sounds in 125 files, covering everything from cycle gears, chains, crankset, spokes, brakes, the saddle, gearbox, bells, bicycle pumps and valves – and of course lots of wheel sounds, spinning at various speeds. It also features outdoor ambiences of cycling, bike passes, skids and even some falls. You won't find any well-oiled, wind-tunnel-tested, aerodynamically perfect sounding bicycles in this library! This pack of sounds has been recorded to capture the extreme creaks and those “old, busted bike” kinds of sounds. 2 SCO gentlemen's bicycles, from 1970-1980, and 1 home trainer, a little younger than the others. Recorded inside a studio with the bikes either being on a dynamo or suspended from the ceiling, all bikes had lavalier microphones mounted front and back, and a microphone overhead of the rider. Some takes has a contact microphone track to add to the misery. The collection consists of 43 stereo recordings of 12 rare, industrial machines used many decades ago in German power plants and industrial sites. It includes the sounds of massive 10KV power switches, a Siemens exciter machine (power generator) built in 1945 and many other vintage machines. All machines were recorded in isolation without background noise and at high sample rates (192 kHz / 24 bit) with a Sound Devices 633 recorder and the Sennheiser MKH 8040 Microphones in close ORTF, taking full advantage of the extended frequency range (30 – 50000 Hz) of the microphones. Some machines were additionally recorded with a stereo setup of Barcus Berry 4000 series contact mics. This library is an intimate profile of a completely original 1967 Chevrolet Corvette Coupe. It boasts a 427 ‘Big Block’ 400 HP engine, a 4-speed Muncie transmission, 3×2 tri-power carburetor, and plenty of mechanical accessories. We recorded anything on the vehicle that made a definable noise: the handbrake, clutch, shifter, turn signal, horn, headlights, hood latch, gas cap, doors, and more. Though the primary focus, of course, was on the beasty combustion and exhaust systems. We collected multi- and single-point, interior and exterior, front to back recordings of the engine cranking, idling, and being cut. We also experimented with a wide spectrum setup for passbys and various driving maneuvers. Files pertaining to the same event are marked accordingly for easy grouping and layering. This collection was designed so that in using multiple grouped files, you can effectively dial in/out the exhaust pipes independently (driver side, passenger side), interior ambience, and direct engine sources as desired. Together with a number of alternative variations, you can use this library to bring any car in your project to life, quickly. Don't be afraid to give it a little gas. Enjoy! Welcome to the first comprehensive collection of BMX extreme sport riding sound effects. Diverse environments, surfaces, obstacles and bikes are at your fingertips now. Captured at 192 kHz 24 bit high resolution with a gear such as ultra-bandwidth Sanken CO100K microphone, the files are ideal source for awesome slow motions, as well as for realistic and creative sound design in general. Need some motor / engine sounds from an unusual source? The Brushcutter library features everything from cutting sounds, engine starts, stops, idles and revving sounds, metallic squeaks and impacts. You’ll find files of different brushcutters working alone and at the same time recorded from different perspectives and distances. The whole recording session took place during a special event, as five 5 volunteers were clearing some harsh terrain for mud turtles. And to make the area habitable for the turtles, all the small branches and trees had to be removed. So not only did the turtles win, so do you as you now have a unique collection of sounds at your fingertips. Brushcutter gets you 41 high quality .wav files, with a total of 87 minutes of recording time. The Burroughs Protectograph that we acquired was manufactured around the turn of the 20th century and had a single unique function – to stamp and emboss checks for banks. The Burroughs corporation has been around since 1886, and was an early force in the adding machine, check stamper and typewriter industries. This Protectograph version had an electric mechanism that would move large printheads down through a ribbon and would stamp a check hard and repeatedly for as long as the print key was held down. Our machine was acquired in perfect working condition. Its keys have a short through but a satisfying clack, and the punch mechanism is a huge whir stamp sound than can cycle if the punch button is held down. We rolled with the case both on and off, which revealed very different sounds from the main electric mechanisms. We ran the whole session with three perspectives miked up – front by the keys, in the back by the punch and a wide perspective perfect for bgfx placement. The front and back mics were Schoeps CMC6.MK4 and the wide mic was an AT 4050 in omni about 5 feet away. Listen to the straight examples give a clear accounting of the type of sounds we got from this machine, and the bent examples show what can really be done with those sounds and the Kontakt instrument. This sound effect library from JordanFehrFX gets you more than 900 button and equipment sounds, captured by Jordan Fehr. Sound effects include buttons, switches, clicks, latches, clasps, bags, zippers, wild foley, machines, ambiences, cases, and more! It also comes with a special bonus library by game audio guru Damian Kastbauer, featuring more than 70 minutes of mono machine recordings and ambiences.